This is one of several 'Kelowna Rockets Player Profiles' features we will be running on our AM 1150 broadcasts this season. Rookie 15 year-old Dillon Dube will make his WHL debut, all be it in a pre-season game, when the Kelowna Rockets first round pick from this springs draft and his new teammates faces the visiting Kamloops Blazers Friday night at Prospera Place. Dube will shed the red helmet he has worn throughout rookie and main camp for a white one with the Rockets logo on its side. The only thing that won't change is the cage he is forced to wear as an underage player. The Kelowna Rockets paired down their main training camp roster significantly Wednesday afternoon prior to an upbeat scrimmage. It looks like the majority of the 15 year-old players (born in 1998) were returned to their respective club teams. These players were obviously ineligible to play with the Rockets this season, outside of a mid-season call up for a five game look-see. The only 15 year-old still at camp, from what I understand, is first round draft pick Dillon Dube. Dube will likely put on a Rockets uniform Friday night when the Kamloops Blazers are at Prospera Place for the first pre-season game for both teams. With the roster numbers down considerably, the first half of the 5:45 pm scrimmage that I witnessed today was high tempo. I thought both teams worked hard in an effort to win a game that looked anything but meaningless. That's where many people get it wrong thinking training camp means nothing. These athletes want to compete no matter what the circumstance and those that don't or who are out there holding back are often exposed. Who did I like in the afternoon scrimmage? One player in particular caught my eye in the morning scrimmage and then brought his game into the 5:45 pm game. Sixteen year-old Joe Gatenby looked solid. Clearly Gatenby can skate. He is very agile on his skates and does a good job to recover if he is caught out of position. What I liked about Gatenby was his active stick. I don't know if today was his best day at main camp but he was noticeably. Gatenby had a thunderous hit in the morning scrimmage that should be noted. With Gatenby impressing and 17 year-old Dalton Yorke doing some nice things physically back on the blue line, I would hate to be the coaching staff deciding on who goes and who stays. Both rookies have an ideal chance of staying around for an extended look with d-man Mitch Wheaton sidelined after undergoing shoulder surgery. Once Wheaton returns it is any ones guess if both stay, if one goes or does a veteran moved because of Gatenby or Yorke's impressive play? Myles Bell took his intensity up a notch in both scrimmages and was constantly around the puck. The veterans should be noticeably, but sadly that often isn't the case. Nick Merkley has gotten better as camp has rolled along. Some of that may have to do with the line mates he is playing with? Let's face it, when you are a gifted play maker like Merkley is you need a winger or two that can find holes or seams so you can get them the puck. One of the goalies still at main camp is 15 year-old Brendan Barry. Barry is the son of NHL agent J.P Barry who calls Kelowna home. Barry is expected to play with the Okanagan Midget Rockets this season. Skating will not be one of Austin Glover's weak points in his game. The 17 year-old has a strong stride and looks just a little quicker than a season ago. Cole Linaker has had a good camp in my opinion. He has had a propensity to drive with the puck towards the net in the scrimmages I've witnessed. We saw little of that in his rookie season. 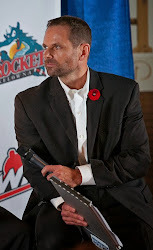 Is it the right thing to do as a member of the media to be high-fiving those around me today following the Kelowna Rockets announcement that they have locked up head coach Ryan Huska for another three years? But then again, I am anything but normal and frankly don't consider myself as a hard nosed journalist looking behind closed doors to find out where the controversy lies within the team. What I am is a glorified cheerleader for the Rockets organization on the radio. 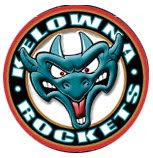 My bread and butter that sits on my kitchen table is indirectly responsible to my employment at the radio station and the job that is created by the WHL having a franchise, the Kelowna Rockets, in the city that I call home. So when good things happen within the organization I like to celebrate them because they indirectly affect what I do even though I am not on the teams payroll. Coach Huska's extension means no less than three more years of spending time with a quality person for no less than eight months of the year. Sure, we do countless interviews for radio but we also eat together, travel together and often talk about other issues that are anything but hockey related. While we definitely have less hair than when he took over the head coaching job in 2007, we have the common bond of being fathers to a young family and juggling what we also have a passion for - the game of hockey. I am pleased to say it is a friendship first, business second. It's been built over years. It hasn't happened over night. Fortunately, while some coaches are extremely guarded, specifically with the teams radio broadcaster, the same doesn't hold true with Huska.I not only appreciate that confidence he shows in me, I also don't take it for granted. The old saying is, 'You don't know what you've got until its gone'. Trust me, everyday when I head to the rink and encounter Ryan Huska, I know for a fact I have it better than any other broadcaster in the league. Cole Martin's brother and who's this goalie? A spent a brief period of time watching the second (5:45 pm) scrimmage of the day at Kelowna Rockets main camp. This one featured Jackson Whistle's Team Black against Myles Bell's Team Red. Again a solid pace to the game with Bell playing on the wing with 15 year-old first round pick Dillon Dube at centre. Dube again didn't look out of place. While not as dominant as he was in rookie camp, the Alberta product showed solid offensive awareness as the physical side of the game seemed to ramp up. Rookie Dalton Yorke and veteran forward Henrik Nyberg seemed to be the two most physical players on the ice in the late day scrimmage. Yorke, while only 17, is physically strong for such a young defenceman and may challenge Joe Gatenby for a spot on this years team. Gatenby is obviously a year younger. Nyberg simply hits everything that moves. No fear goes a long way. It was interesting to watch forward Mason Martin. Martin is the younger brother of Kelowna Rockets veteran defenceman Cole Martin. While the Martin brother's are playing against each other at main camp, the Bowey brothers, Madison and Connor, are teammates on Team Black. Again Rourke Chartier was a bright spot. His board battle level was solid. The 17 year-old was always around loose pucks. It was nice to see Austin Glover get a goal for Team Black off a nice wrister. Nick Merkley looked much better in the afternoon scrimmage than he did in the morning session. Not like he was bad this morning but the 16 year-old made some nice plays in an effort to set up his teammates. Just imagine Merkley on a power play unit with Rourke Chartier and Dillon Dube in two years time. Is Cole Linaker a poor man's Colton Sissons? Linaker works...and works....and works and is hard to play against. Still light on his skates at only 168 pounds, Linaker makes things happen. I say he is a poor man's Colton Sissons because he has yet to perfect a real hard shot and needs more work at becoming a dominant player in the face-off circle. Outside of that, Linaker has no 'give up' in his game which makes him a solid 6th round bantam pick. I was told the reason the boards are white at Prospera Place during training camp - void of any advertising - is a new material is on order which will be placed over the advertising being installed. My understand is it will be more durable from puck marks/stick marks while allowing the rink crew the ability to change in and out advertising more efficiently. Goals were hard to come by in the first scrimmage of the day at Kelowna Rockets main camp. The two incumbents, Jackson Whistle and Jordon Cooke, were battling one another at opposite ends of the ice. It was nice to see a smiling Jake Morrissey backing up Whistle while rookie Brodan Salmond was on the bench observing Cooke's antics. Cooke's best save came early in the scrimmage with a nice glove hand save on Rourke Chartier. It will be tough for Morrissey or Salmond to make the team. Lets face it, Cooke and Whistle are 1-2 and that won't change. But these two rookies need to remember a spot will open up next season when both are 17 and in only 12 months, one or the other will be wearing a Rockets uniform full time possibly? I had a chance to see 17 year-old rookie Kris Schmidli for the first time. The Swiss born forward didn't stand out in the first scrimmage, but would you if you had traveled half way around the world in an effort to chase your NHL dream? Rourke Chartier looked solid in the first scrimmage.Coming off a gold medal effort at the Under 18's, Chartier is wearing #13. Chartier usually wears #12. Colton Sissons is participating in main camp, but he won't be here long. Sissons will play pro this season with the Nashville Predators. What I love about Sissons is he isn't mailing it in at Prospera Place. The North Vancouver resident always has 'try' in his game and his work ethic can't but rub off on his old teammates. Carter Rigby and Mitch Wheaton didn't participate in the first scrimmage of the day. Those two are recovering from shoulder surgeries this summer. I don't have any results, but all the players I've talked to suggest Rourke Chartier had a solid 5 k run during physical testing. The 17 year-old finished first last year in the run that most players dread. Austin Glover looked good in the opening scrimmage. The 17 year-old looks composed with the puck and looks like a veteran. He too came back to Kelowna in phenomenal shape. That is a clear message to me that these players are not satisfied with what happened last year - personally - and want to make inroads into more responsibility on the ice. 1) Who will the Rockets three overage players be this season? Right now the team has four 20 year-old's. Defenceman MacKenzie Johnston is joined by last years leading scorer Myles Bell, fourth year forward Zach Franko and goaltender Jordon Cooke. Hard to imagine at this time last year the team had only two overage players with Mitchell Chapman hobbling around with a bad ankle and Spencer Main hampered by a series of concussions. The Rockets had to wait for other WHL teams to essentially release 20 year-old's before picking up JT Barnett and Cody Fowlie off waivers from Everett and making a minor deal with the Kootenay Ice for Dylen McKinlay. As it turned out all three made significant contributions to the teams record setting 52 win season. I anticipate general manager Bruce Hamilton taking a hard look at what other teams do with their overagers at cut down day (October 10th) and then determine which three gives his team the best chance at winning. If I'm a betting man, the safest 20 year-old of the four currently on Rockets roster is Myles Bell. 2) Does Myles Bell return for his 20 year-old season? If Myles Bell (pictured right) hadn't been drafted by the New Jersey Devils this summer this question wouldn't have made my top five. Now that he is property of an NHL team you can't but wonder what type of interest the Devils will show when Bell attends rookie camp. Bell is physically mature which is a clear indication the Calgary resident could have success playing against mature athletes at the pro level. Should the Devils sign him after a solid camp then the Rockets coaching staff may start sweating over the prospect of losing a player that could legitimately score between 40 and 50 goals in his final season of major junior. My guess is the Devils believe they have a late bloomer on their hands that will be able to play pro but still needs another year of seasoning. Let Bell take another year to learn the forward position and play on a solid WHL team with fellow Devils prospect Damon Severson. 3) After backing up Jordon Cooke in goal last season, does 18 year-old Jackson Whistle make a legitimate bid for the starting job this season? There was no question last season that it was time for Jordon Cooke to stand up and show those around the WHL that he indeed had the makings of a solid WHL starter. Cooke won 37 times and had a consecutive win streak that stretched to a franchise record 20 games. The then 19 year-old appeared in 54 of the teams 72 regular season games, a huge contrast to the 25 he appeared in the year prior. While he was criticized for giving up some soft goals in the playoffs, he again lost only twice in regulation time in 11 playoff starts with four of those six losses in post season coming in overtime. What has many wondering if Whistle can be a legitimate number one goalie is his 15 and 2 record last season and his impressive 1.93 goals against average. On top of that his save percentage was a mind boggling .930. I want everyone to remember that eight of Whistle's 15 wins in 2012-2013 came against non-playoff teams. Can Whistle be a starting goaltender in this league? Sure he can, but when the puck drops on September 20th I anticipate everyone would be a tad more comfortable with Cooke at the controls and Whistle providing a solid insurance policy. 4) After two years as captain, who replaces Colton Sissons as team leader? Colton Sissons will participate in Rockets main camp, but trust me his days with the organization are done. He is about to become 20, is signed by Nashville, and is ready for the pro game. So with Sissons' departure after two seasons as captain, who takes over the captaincy of the team in 2013-2014? You always look to the older player to fill the void. Myles Bell, if he returns to junior, may be the best bet but their are younger players on the roster that may not be ready to take the baton from Sissons just yet but are a year away from becoming a member of the leadership group. I think Rourke Chartier would be a great captain, but he is still a year or two away from assuming that role. Tyson Baillie showed in the playoffs last year that he is a warrior and could also wear the 'C' if he too were a year or two older. For now, my belief is Myles Bell is the best bet to become captain because of the respect he has among his teammates. Being acclimated to captain isn't easy. Just ask Sissons. It essentially took him two years to get used to the role. Does Bell even want the added pressure of leader being thrust upon his shoulders? This could be one of the most interesting developments in the first few weeks of the regular season to see who is named captain and who is added to the leadership group as assistants. 5) How many 16 year-old's will the Rockets carry this season? Usually the team carries three 16 year-old rookies. Last year, Rourke Chartier, Austin Glover and Riley Stadel filled those spots. This season with a team that returns all but four players from last years roster, two 16 year-old's may be all their is room for. Without question Nick Merkley, the Rockets first round pick from two seasons ago, finds himself taking up one spot but who is handed the second spot with limited duty? With a extremely heavy laden defensive core with all seven players returning from last season, does newcomer Joe Gatenby find himself in the mix? Gatenby was the Rockets second overall pick in 2012 and played last season with the Midget Okanagan Rockets. 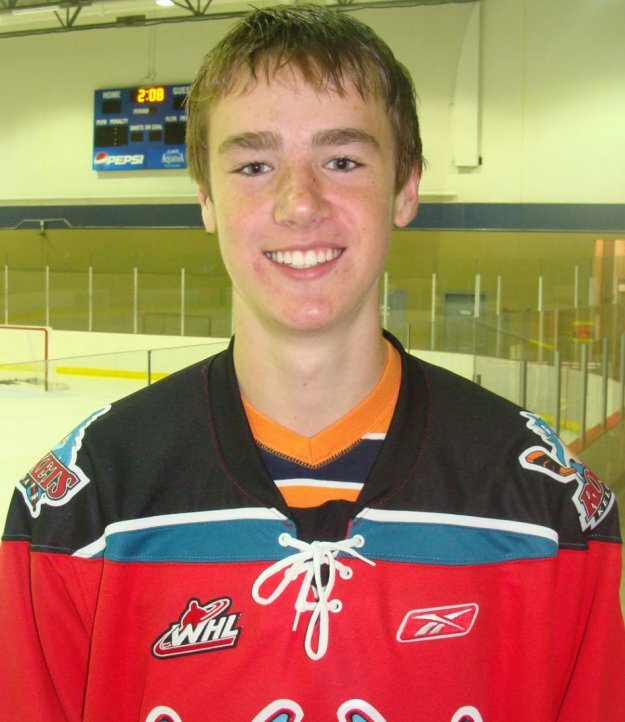 When the team won a WHL title in 2009 they managed to dress three 16 year-old's. Outside of Tyson Barrie, Kyle Verdino and Curt Gogol saw very little ice time. Does Gatenby want to be sitting out as a healthy scratch because he can't play in the teams top six d-men or is he better suited for another season of midget hockey to perfect his game? The view may be that he will learn more by practicing with the team and playing the odd WHL game over another year in the BCMMHL. Without question the next five weeks or so will be interesting times as we find out the answers to all five questions being posed on this latest blog entry. He was expected to dominate. If he didn't against his peers we would have a problem. I watched 15 year-old Dillon Dube closely at the morning session on day two of Kelowna Rockets rookie camp. Was he as good as advertised? Would he be consistently inconsistent like many young players are as they try to develop their game? Would he shoot out the lights in one session before becoming invisible in another? So far, the Cochrane, Alberta resident is making a huge impression as a no miss prospect. Dube's skating ability is above average as his awareness in the offensive zone. You can't teach that skill level. Either you have it or you don't. The 15 year-old spreads the puck around to his teammates but knows when a seam opens, its best to take it to the hole (using a basketball analogy) and shoot the puck in a good scoring area. Dube is clearly the best player on the ice. It will be interesting to see how he blends in when main camp opens next week. Dube played this past season in Notre Dame. Who was the last Kelowna Rockets first rounder to play at Notre Dame and end up in the NHL? Answer: Tyler Myers. 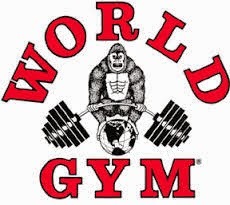 Despite all of the talk about Dube, their was one defenceman who impressed me during the morning workout. Nolan Ferguson is a smaller play with loads of offensive potential. I loved Ferguson's composure with the puck and quick decision to join the rush and create something in the offensive zone. Again, this was a one time viewing for me, but I liked what I saw from the 15 year-old blue liner. With two days in the books at rookie camp, plays have two more chances to impress the scouts. There is still a lot to play for considering a player can be dropped from the Rockets 50 man protected list, or if he isn't already on it, can be added. Director of Player Personnel Lorne Frey told me earlier this week that he was hoping to list a handful of players from rookie camp. I had a chance to take in the afternoon session on the first day of Kelowna Rockets rookie camp. While I didn't happen to see Dillon Dube, the Rockets first round pick from this summers draft, by all indications he is the real deal. Dube can skate, has an offensive upside and uses his teammates around him well. It is safe to say that regardless of the other nine players in the draft class of 2013, director of player personnel Lorne Frey didn't miss by taking the Cochrane, Alberta product 21st overall. Day one of rookie camp is a combination of getting rid of nerves and forming chemistry with your teammates. When the 180 players are broken into ten teams and you don't know your line mates first name, the action on the ice is disjointed and players often try to do to much by themselves in order to stand out. I anticipate day two action taking a significant jump from day one. I felt for the goalies in the afternoon session. The puck is often turned over resulting in unpredictable offensive chances where a goaltender is hung out to dry. The goalie pictured on the right is Calgary born Brodan Salmond. Salmond is the Rockets 10th round pick from this summers draft. Salmond's father Scott is the senior director of hockey operations for Hockey Canada. In case you are wondering, all goalies wear their jersey backwards in an effort to give the onlooking scouts a better idea of exactly who's in goal. Fifteen year-old players come in all shapes and sizes. The smallest player at camp is only 5'5 and 118 pounds. The heaviest is a 5'11, 220 pound forward. I won't lie, it was nice being back in the rink. It felt a little odd though not seeing Wayne Pansegrau in the building. If you didn't catch it on my Twitter feed, the general manager of Prospera Place is now employed at Penticton's South Okanagan Events Center. Life will move on, but Prospera Place - in hockey terms - lost their MVP. The first thing I noticed at Prospera Place was no advertising along the boards. It looked like I was transported back to the 80's. All white boards looks odd. I hated the ads when they were first introduced and now I don't like the look without them. The first returning Rockets player that I had a chance to shake the hand of was defenceman Madison Bowey. Looking fit and bright eyed, the 18 year-old introduced me to his 15 year-old brother Connor as the two sat watching the afternoon scrimmage. Swedish forward Henrik Nyberg and teammate Cole Linaker were both on the ice as officials to keep the peace during the 4 o'clock session. Nice to see 'Hank the Tank' back for his 19 year-old season and I couldn't get close enough to see if Linaker was able to get his braces off over the summer. When he does he will have the best smile around. Veteran goaltender Jackson Whistle is getting a good workout these days practicing with area pro's. On Thursday the 18 year-old was facing shooters like Dallas Stars Jamie Benn, Nashville's Shea Weber and Anaheim's Ryan Getzlaf. You have to love the Okanagan. If it isn't Montreal Canadiens Carey Price in goal during a pro workout at CNC its Leafs netminder James Reimer. Even Kelowna born Keith Hamilton, who is headed to university this fall has spent some time with the pro's patrolling the net. I made a quick pit stop at CNC to speak with Shea Weber before he heads off to Canada's Olympic Orientation camp and ran into Canadiens forward Travis Moen. I will speak with him on Monday and share that interview. It was also nice to touch base with Colton Jobke. The former Rockets d-man looks like a man. 'Jobber' is physically mature for being only 21 and is excited about his first full season of pro hockey, likely in Houston of the American Hockey League. It may be the first day of Kelowna Rockets rookie camp but the Toronto Blue Jays Super Camp made a stop in the city Thursday allowing me to interview legendary Jays outfielder Jesse Barfield. Ready or not, hockey is back! Ready or not, hockey season is here! The ice was put back into place at Prospera Place last Friday and now the Kelowna Rockets rookie camp officially begins with what is expected to be an exciting winter of hockey. Close to 180 new faces will attempt to catch the eye of Rockets Director of Player Personnel Lorne Frey over the four days, but realistically about five or six rookies will be fortunate enough to be invited to main camp next week. The most likely to make the move to main camp is 15 year-old Dillon Dube (pictured right). 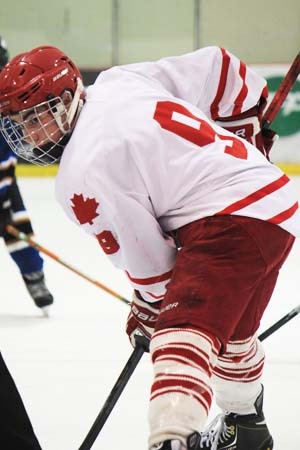 Dube was the Rockets first round pick from this summer’s WHL bantam draft and traditionally the organization likes to have their first rounder mingle with the veterans. It’s a formula that has worked well in the past with Luke Schenn, Tyler Myers, Tyson Barrie, Shane McColgan and most recently Rourke Chartier. It will be interesting to watch 15 year-old Connor Bowey in action over the next few days. The Winnipeg defenceman is the younger brother of veteran d-man Madison Bowey. I anticipate Connor having the skating ability of his younger brother, but obviously without the physical maturity of his older bro. Connor Bowey was an 8th round pick of the Rockets in 2013. I’m always interested to see which goalie establishes himself at rookie camp. Over the years you’d be hard pressed to get excited about a goaltending prospect. Even Jordon Cooke, who was a raw rookie at 17 earned a backup spot with the team, not at rookie camp but at main camp to Adam Brown. Brown, as a rookie, showcased his skills at main camp before earning a spot backing up veteran Mark Guggenberger in 2009. Does a 15 year-old goalie make a huge impact and separate from the pack in 2013? I sure hope so. While Cookie and Jackson Whistle have the position locked up, who is the future of the Rockets organization in the most crucial position on the ice? We are about to find out over the next four days. Random Thought #1: Looking to get away from the Okanagan heat? The ice officially goes into Prospera Place tomorrow. Call it - Good Friday! Random Thought #2: I learned PG Cougars radio guy helps paint logos on ice. Disaster if I did same. Using crayons I never stay in the lines. Random Thought #3: Kelowna Rockets rookie camp features 180 players. Second biggest camp ever. Can Lorne Frey name them all and recognize every face? Random Thought #4: Best part of rookie camp is meeting prospects. Worst part is seeing fear in their eyes as I throw a mic in their face. Random Thought #5: I've interviewed many shy 15 year-olds over the years. Best were Madison Bowey and Shane McColgan. Worst? Richard Kelly. Random Thought #6: Rockets second round pick from this summers bantam draft won't attend. Cal Foote is sidelined with a broken arm. 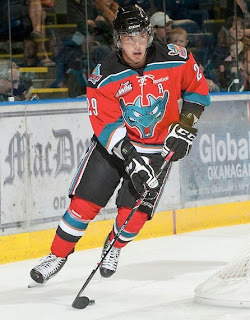 Random Thought #7: Speaking of McColgan, the former Kelowna Rockets forward underwent surgery to repair broken thumb. Broke it working out. Random Thought #8: If I'm not mistaken, Prospera Place/Skyreach Place is celebrating 15 seasons of hosting the Kelowna Rockets in 2013/2014. Random Thought #9: Can you imagine hosting 180 players for rookie camp at the old Memorial Arena? Random Thought 10: Where is Cirque du Soleil this year? They are usually here in August, forcing the Rockets to hold rookie camp at CNC. Not this year. The Okanagan Rockets are searching for their 1st play by play voice for the 2013-2014 season. The Rockets are planning on webcasting all 20 home games from the Capital News Centre this season. At the top of qualifications required is dedication. 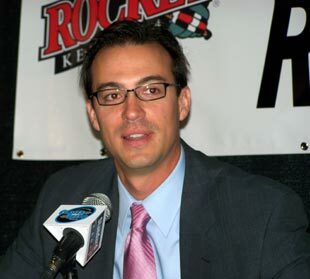 Rockets general manager David Michaud first and foremost is looking for someone to represent the Rockets brand with consistency. "We feel we can help someone who has always had the desire to become a sports broadcaster, but has lacked the opportunity to have a team to call games for. Getting a chance in the BCHL, or the WHL doesn't come around very often, and you need experience. We want to provide an individual the chance to call 20 games and help assist our media relations department as well." The Rockets games will all be played out of the Capital News Centre with games slotted typically for 3:00 pm on Saturday's and 10:00 am on Sunday's. The Rockets will provide all gear for the interested party.